When I was a kid, I ate way too much white chocolate. Okay, maybe it was not all that long ago. Anyway, it was (is) my favorite kind. I would even consider myself to be a white chocolate expert by now. An amateurish expert, at least. Or a professional amateur. 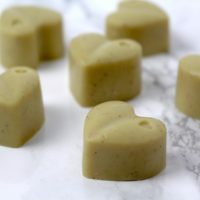 However, you can trust me on this one: this recipe approaches white chocolate closest in terms of taste, consistency and looks. It took a while to create it but all the recipe testing was so worth it (it always is actually, but with this one in particular). After all there were some standards to be satisfied: Obviously it had to be white. Most importantly, it had to be crispy when you take a bite and then melt in your mouth. And this chocolate, my friends, beats it all! It’s so good, you won’t need any other chocolate anymore. 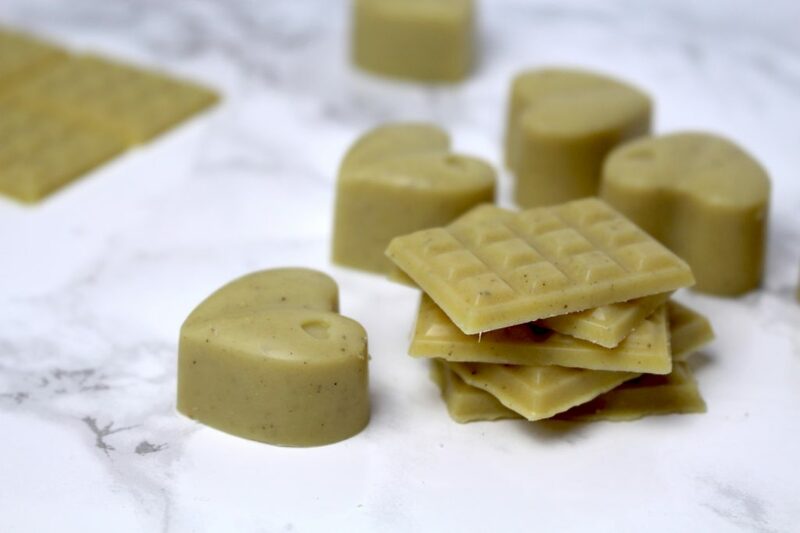 So if you are serious about white chocolate – and I’m saying this because some just don’t appreciate it enough – you’ve got to try this recipe! 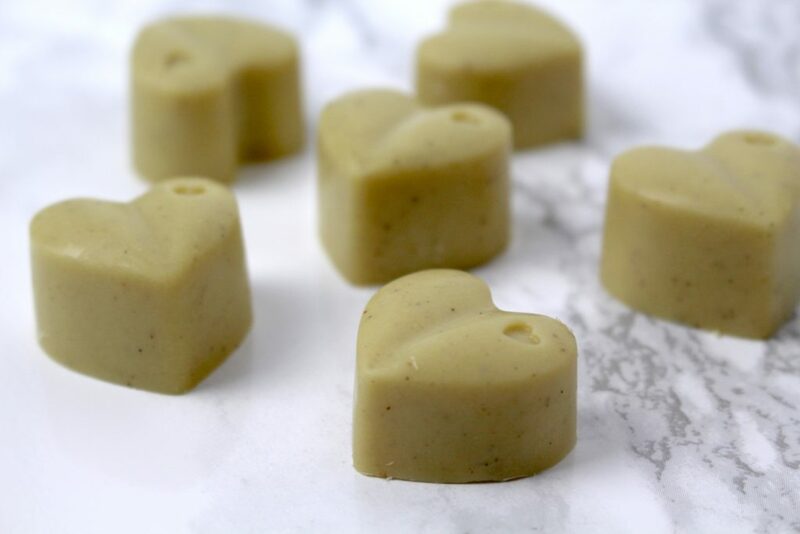 Just as my creamy almond butter chocolates, the white ones are very satisfying. Now, whenever I want white chocolate I mix it up in no time, knowing exactly what’s going in it. 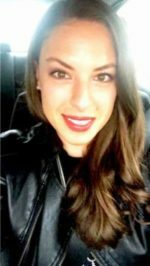 How I came up with this recipe? I knew, for that creamy texture I desired, I had to add something to the cacao butter. 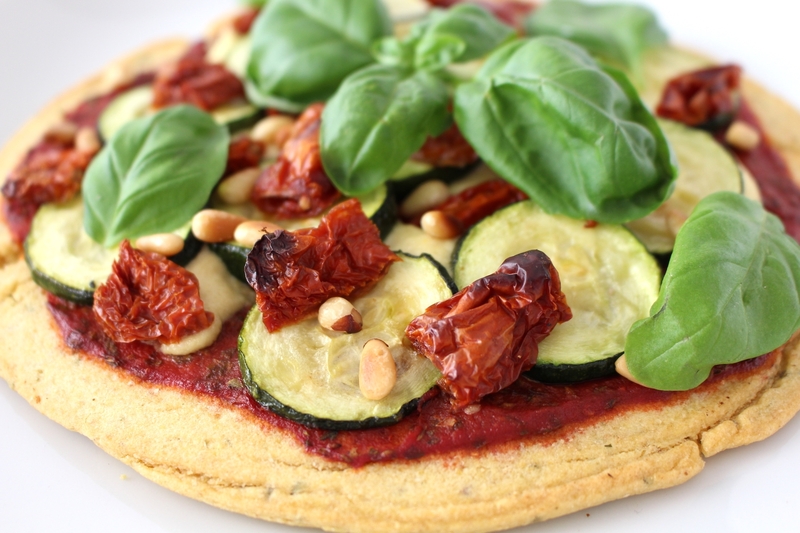 So I tried it with almond butter first, which happened to be pretty good already. Then I remembered noticing how well cashew and vanilla go together a while ago, as you may have read in one of my first blog posts about vanilla crescents. Finally – and you may be able to guess it by now – cashew butter defeated almond butter. Anyway, these chocolates are made of four wholesome ingredients: cacao butter, cashew butter, maple syrup and bourbon vanilla. 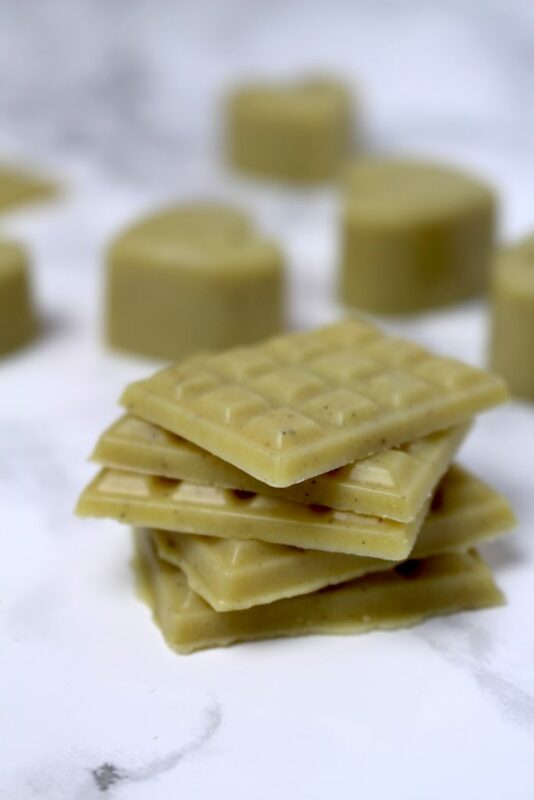 A quick & easy recipe for crispy white chocolate that melts in your mouth. 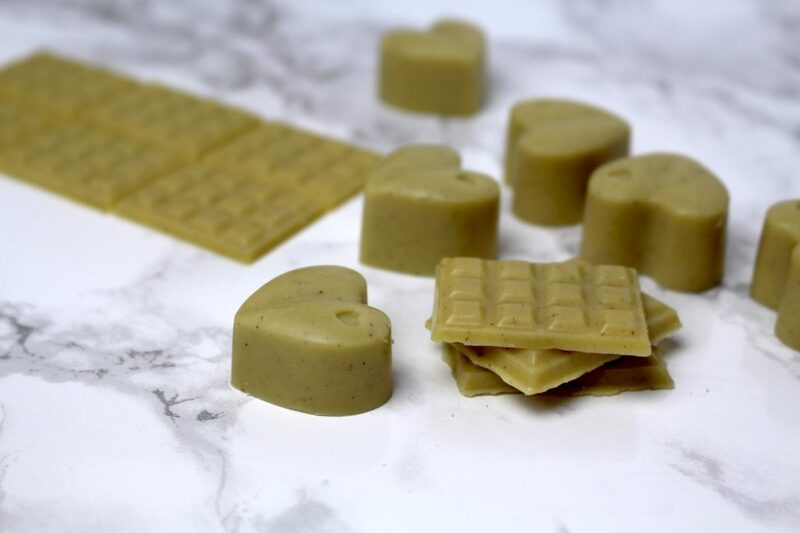 If you are serious about white chocolate, you've got to try this recipe! Start by melting the cacao butter using a double boiler or the water bath method, stirring continuously. Once melted, add all the other ingredients (cashew butter, maple syrup and vanilla pulp) and mix to combine. 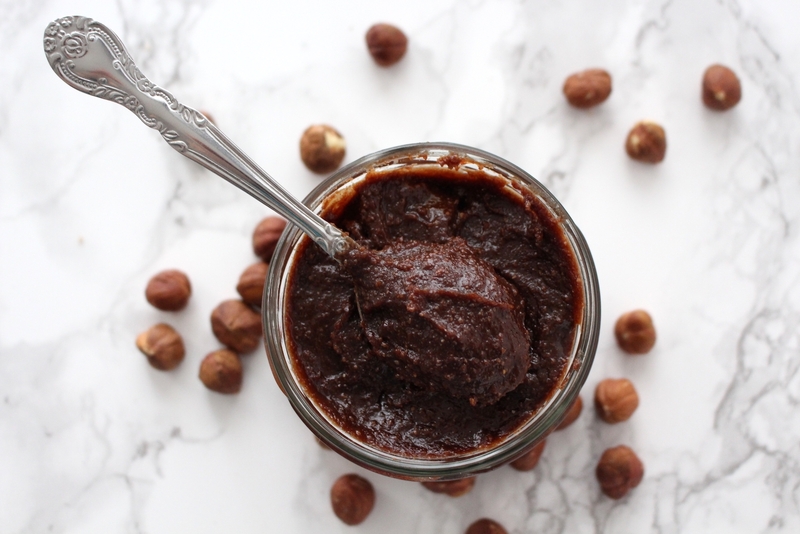 *Make your own, simply by processing cashews in a food processor until you end up with smooth creamy cashew butter. This might take 5-10 minutes though, so be patient. The chocolate is best kept in the fridge.